This vigourous, semi-evergreen shrub or tree bears clusters of small creamy-white flowers in June. These are followed by masses of almost spherical, bright red berries in late autumn. This fabulous autumn display corresponds with the normally deep green leaves taking on a bronze-tint. This is an excellent specimen plant for a sunny spot, but it needs space to express itself. The berries are highly attractive to birds. Garden care: After flowering in late spring or early summer, lightly cut back any branches that spoil the symmetry of the plant and apply a generous 5-7cm (2-3in) mulch of well-rotted garden compost or manure around the base of the plant. In autumn trim back lightly any branches that obscure the display of fruit. We live in an exceptionally windy inland area of northern Scotland and this does well and provides berries for the birds in winter. Hard to get anything to grow here but this is a welcome exception. Excellent plant for height and structure in a shady border. This is a relatively quick grower and I can't wait to see how it develops over the next few years. Reall pleased with my purchase. Crocus always supplies good quality plants. Crocus offer the most healthy plants for online purchases. I have been shopping with them for many years. I trust them. I am looking for a hedging plant eventually about eight foot high for privacy I have been recommended Cotoneaster x Watereri Cornubia but it needs to kept quite flat againest a fence because I have a herbaceous border in front. Would this be suitable and when would it need pruning ? Hi, How tall would the plant be in the 3 litre pot? Hello there This plant will be approx 30-40cm tall in a 3lt pot. Hope this helps. 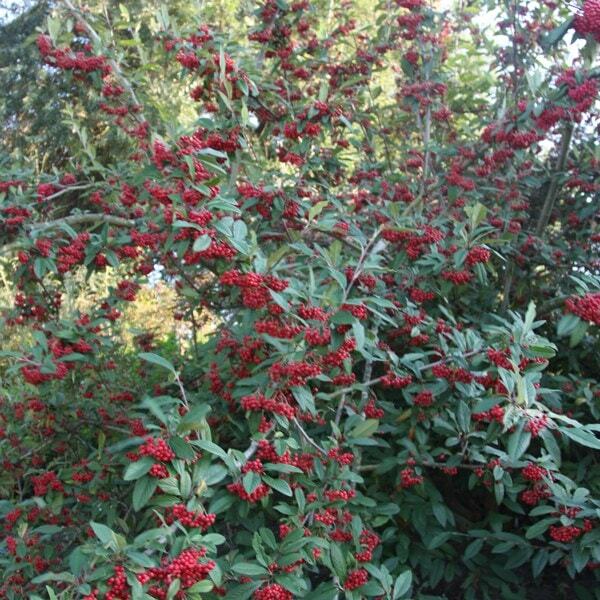 I'm looking for a something to plant that will attract birds to my balcony, and a search result came up with the Cotoneaster frigidus 'Cornubia'. Before I buy it from you, can you please tell me if the product will already have fruits on it? Thank you. Why hasn't my Cotoneaster produced fruit? I bought a Cotoneaster shrub from you approx 18 months ago and it has not produced any berries. It did not even flower in the spring. Can you please tell me why? It is relatively common for newly planted shrubs to direct all their attention into producing a good root system rather than flowers or fruit so it may just need time to settle in. There are however several other reasons why plants don't produce flowers (and later fruit). These include too much shade, not enough water during the summer months or it may just be the type of fertilizer you are using. Fertilizers that contain high amounts of nitrogen will promote lots of healthy leaf growth, while potash encourages fruit and flowers. Therefore, to give your Cotoneaster a bit of a push, you should feed it with Sulphate of Potash throughout the growing season.